If you’re a bike enthusiast who loves to be on the ride, you could testify how frustrating it is when the bike’s tire gives way midway through the journey. In addition to disrupting the ultimate joy, a punctured tire poses another huge problem: of replacing it. For some people, replacing a bicycle tire might be the most difficult job in the world. For others, however, this job is a cinch. Why the disparity? Well, for one reason, the people who belong to the latter category are mostly veterans of the sport. After finding themselves in similar situations in the past – with no way out, the veterans were forced to learn this “art”. 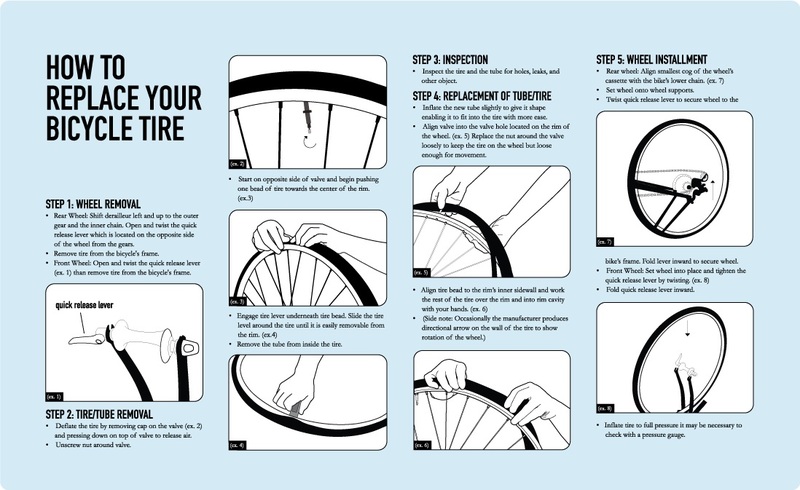 If you belong to the former category – and don’t want to feel deserted midway through your journey, it is imperative that you learn how to replace a bicycle tire. In addition to filling you with confidence, this skill would make sure that you won’t have to wake any of your friends from your sleep to get you out of the predicament. A pump: When purchasing a pump for your bicycle, make sure that it fits the valves which are mounted on the inner tubes of the tire. While there are many types of pumps, I would recommend a mini-pump for obvious reasons. In addition to being portable, it is also less prone to theft. Tire levers: If you have already gone looking for tire levers, you may know that they often come in sets of three. This is due to the fact that different tires have different nuts, which require different sets of levers to operate upon. To do this, take out a tire lever and slip its flat end under the bead. Hook the opposite end of a nearby rod. Now, take out the second lever and insert it in the space present between the rim and the tire. Continue going forward with this step unless one side of the tire is completely off. Repeat the method to separate the other end of the tire from the rim. Finally, pull out the culprit (a.k.a. the inner tube which is damaged). Tip: You can do the above-mentioned step with your hand. Moreover, if you feel that the tire bead has already loosened up, you might not even need levers. As they say that you cannot redress a situation unless you’re aware of its cause, similar is the case with a flat tire. In addition to the obvious cuts and holes – a worn down tread, cracked rubber, and a flat spot in its center are some of the many reasons of a flat tire. To inspect the reason of the damage, carefully insert your finger in the inside of the tire and run it along its inner radius. This should give you a clear indication of anything which has caused the problem – a nail, a shred of glass or simply a thorn. In some cases, you may find that none of the abovementioned materials have caused the damage. Rather, all you could see are two side-by-side holes. This, my friend, is an indication that your tire was underinflated before it went bust. Before installing a new tube, make sure that it is slightly inflated. Also, place one side of the tire onto the rim. Starting from the valve hole, progressively insert the tube into that side of the tire. Similarly, adorn the other side of the rim with the tire, before filling it with the remaining part of the tube. Make sure that there are no kinks in the tube when you have inserted it into the tire. Since you are likely to be in the wilderness, an automatic air pump might not be available. Hence, as is the case with most of the bike mechanics, you would be left with a hand air pump. Here, some people make a mistake which you should avoid. Most people think that once they have seated the tire onto the rim, they should immediately inflate the tire to its desired pressure. While this technique seems sound on paper, it isn’t recommended by experts. Why? Because, although you have seated the tire, it could still get off. Hence, pumping it to its desired pressure may force the tire off the rim. Consequently, you might have to repeat the step 3 again. Thus, unless you don’t believe in the adage which says that practice makes a man perfect, only inflate the tire to half of its recommended pressure. At this stage, carefully check that the tire has remained seated on the rim. After ensuring, pump the tire to the recommended pressure.